With 8,000 to 11,000 species of flowering plants, 150 to 200 species of reptiles and amphibians, 700 species of birds, 90 species of bats, over 100 species of large animals, and 500 species of fish, Lao PDR is rich in biological resources. However, activities such as land development for agricultural production, particularly slash and burn cultivation, industrial activities, urbanization, deforestation, and poaching of wildlife have led to a great loss of natural habitats and exerted increasing pressure on biodiversity. In an attempt to conserve and make the most effective use of biodiversity, the Government of Lao PDR (GoL) is encouraging the public and private sectors, as well as development partners to get involved in biodiversity conservation programs. Responding to the government’s call, Mr. Nitsavanh Louangkhot Pravongviengkham, president of Union Development Agricole Import-Export Public Company (UDA Farm), pledged to support the government in its conservation efforts. 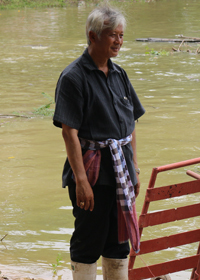 Mr. Nitsavanh’s company started its involvement by replanting trees in 2000. After this, he popularized the use of environment-friendly agricultural production methods in pig farms, cattle ranch, and vegetation across a 2,000-hectare land near the Nam Suang River in Phon-Hong District, Vientiane Province. With the enriched food chain within the farmlands, migrating egrets and yellow teal ducks started appearing near the water hyacinth and other aquatic plants in the river in 2003. Mr. Nitsavanh and UDA Farm attempted to drag the floating plants closer to the farmlands little by little over a span of one year prevent the migrating egrets and yellow teal duck from getting shot by local hunters. His actions faced opposition from locals who did not understand the importance of protecting such species and biodiversity in general. Still, he continued with his work. To sustain his initiative, Mr. Nitsavanh requested district authorities to allow him to pursue conservation activities in the Nam Suang River. His goal is to provide safe natural habitats and reproduction zones for the indigenous aquatic animals. This will then enable them reproduce and increase their population, which will be favorable to sustainable fishery initiatives in local communities. At the same time, the conserved basin will serve as a feeding pool for migrating birds. On November 15, 2012, Mr. Nitsavanh was officially authorized by the Mayor to protect a part of the Nam Suang River with a total area of 2 kilometers long and 200 meters wide. As a result, the number of migrating egrets and yellow teal ducks gradually increased over the years. Today, over 10,000 egrets and yellow teal ducks seasonally migrate in the farmlands between November and August. Locals consider the farmlands one of the most wonderful wild bird watching and study areas. The conserved basin is now producing a significantly larger number of aquatic animals, sustaining fishery yield within local communities. The rising number of migratory visitors not only help educate communities about the importance of conservation efforts, it is also key to promoting sustainable fishery among locals. Apart from conserving migrating birds and aquatic animals, Mr. Nitsavanh is also helping protect Mekong’s giant catfish (Pangasianodon), an endangered species. He has been raising hundreds of Mekong’s giant catfish in hopes of studying the species and reproducing them for release back to the rivers. The cultured Mekong’s giant catfish live in an allocated basin around the forest where migrating birds live. He is also involved in biogas production for natural conservation and reduction of greenhouse gas emissions. UDA Farm has a fixed dome biogas digester measuring 2,500 cubic meters that does not only produce 26 kwh for domestic use, but also helps the company save approximately US$ 15,000 per month. It also reduces methane gas emission, a significant greenhouse gas contributing to global warming and climate change. The farm is capable of establishing three more digesters as big as the existing one in case there are interested investors. Mr. Nitsavanh believes that while businesses can have direct or indirect impact on biodiversity, they also have relevant biodiversity-related knowledge, expertise, and resources needed to conserve biological resources. The business sector is an integral part of the solution to biodiversity loss.